W Technology – an eC-test-mate user reports. Alex Wilkinson of W Technology, 1 Chamberlain Place, Kidlington, Oxford, UK, became very interested in the eC-test-mate after seeing it demonstrated on the Eurocircuits stand at a recent trade show. 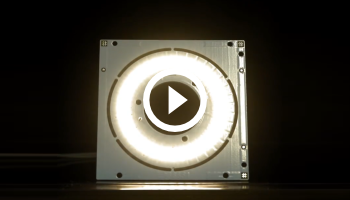 W Technology develops and designs circuits, PCBs and firmware for a wide variety of products and product areas. 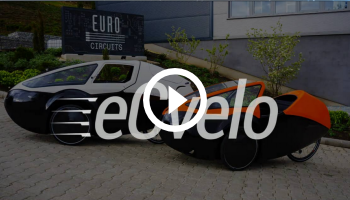 Following on from the design phase, the prototyping and production stages which W Technology can also take care of usually require some degree of testing. As a result they are always looking for smart ways to speed up and automate testing while reducing the amount of manual intervention. The eC-test-mate looked particularly ideal for a product W Technology builds for John Wainwright Systems – an access control specialist. The board in question has an RS485 interface which could easily be used as a test interface into the board, and lots of relay controlled outputs, all of which need to be tested. It also has numerous inputs and outputs for inter-system connections, entry card readers, door sensors etc. For this board to be delivered to the client and meet W Technology”s high standards, all of these interfaces need to be tested. That”s where the eC-test-mate looks ideal. On the surface, it looks like it can provide multiple automated test functions and measurements and take out the majority of the manual testing currently required. 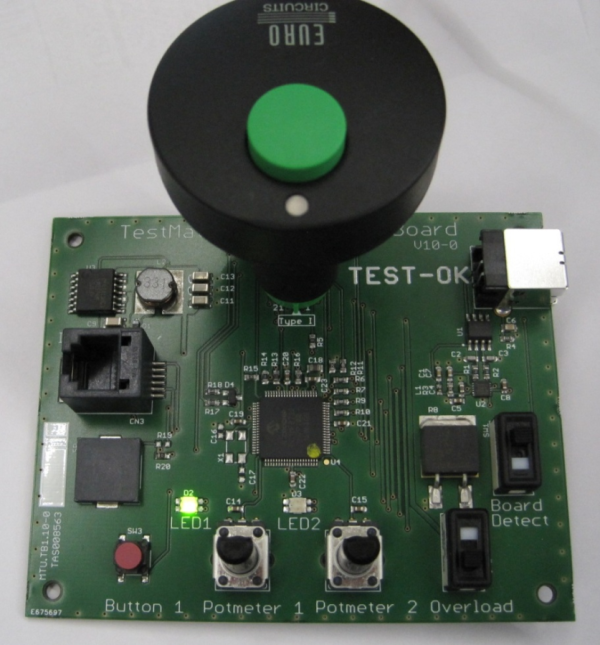 The fact that it runs a scripted test process means it should be easily adaptable to any future changes made to the board design or functionality, which is inevitable. 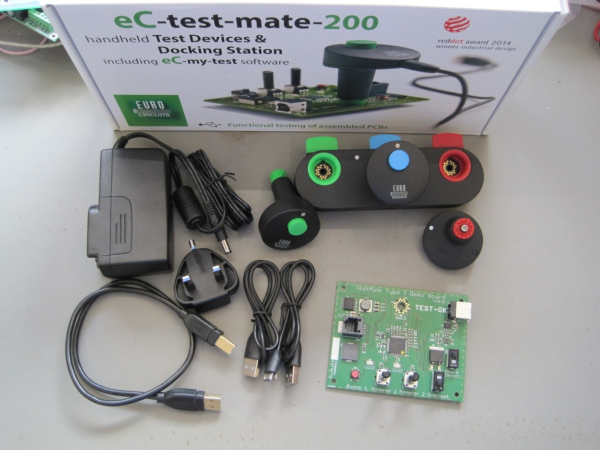 So W Technology took delivery of an eC-test-mate system complete with the Eurocircuits eC-test-mate Demo Board. The PC software is freely available from www.eurocircuits.com/test. Version 1.2.1.1 was available at the time of writing. Installing the software is easy and only takes a matter of seconds. 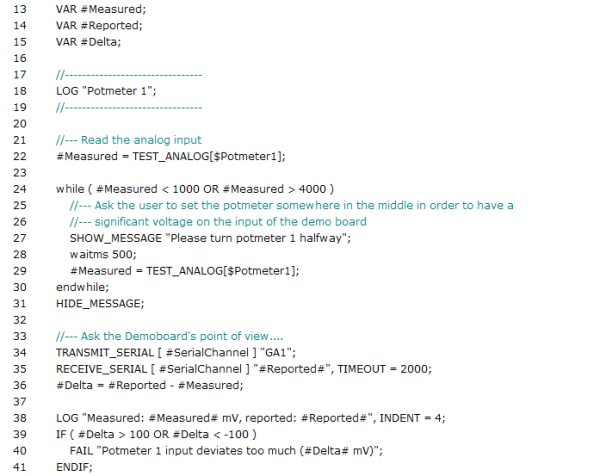 The demo board test scripts are available from the same location and come in a .zip format. The first thing you naturally do with a .zip file is to open it up and extract all the files, but in fact this is not necessary as the eC-test-mate software works with the zip file itself, saving you having to open it and create a folder for all the files it contains. 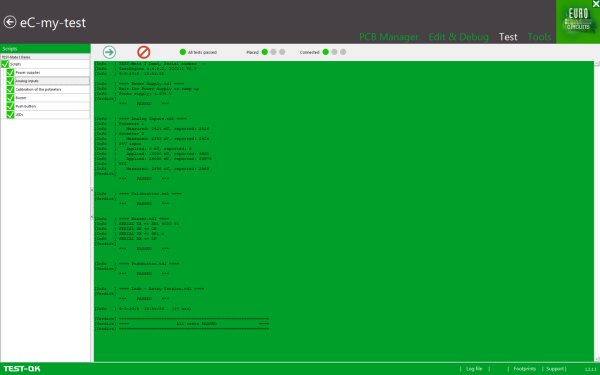 Make sure the required test head is plugged in to the PC (In this case, test head 1, green), click on the newly imported board and then the green tick at the bottom, “Activate”. Power supply to the board and testing for over-current conditions. Reading analogue inputs, setting analogue output voltages. Setting up on-board potentiometers to be within a certain range or allowing the operator to set them to a particular value and recording that value. Setting outputs and requesting operator confirmation of the changed state. Reading switch inputs and automatically moving on once activated. Sending and receiving RS232 commands. At the end of the test the screen briefly flashes red or green, as does the test head, to show the overall result. Failure in any one section of course results in an overall fail result. Helpfully, if it failed in one section and you go to test again, you have the option of retesting just that section which saves time by not going through the complete test process again. Click on the “Edit & Debug” heading at the top of the screen and you have access to the test program scripts. These are a bit like a simplified version of C. Unusually you can”t actually type the text of the program script, instead you select the required command from the box to the right and fill in the appropriate parameters. A benefit if this is that you avoid introducing syntax errors that are otherwise quite easy to make, particularly with an unfamiliar language. 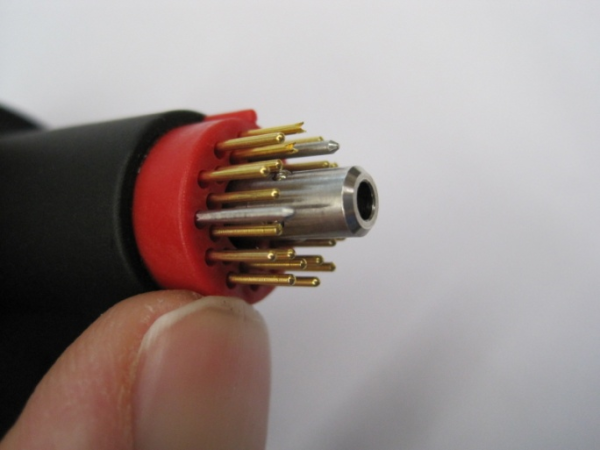 The test heads themselves look to be pretty robust – the test pins are shrouded in a spring loaded plastic cover to hide them when not connected to the target PCB. 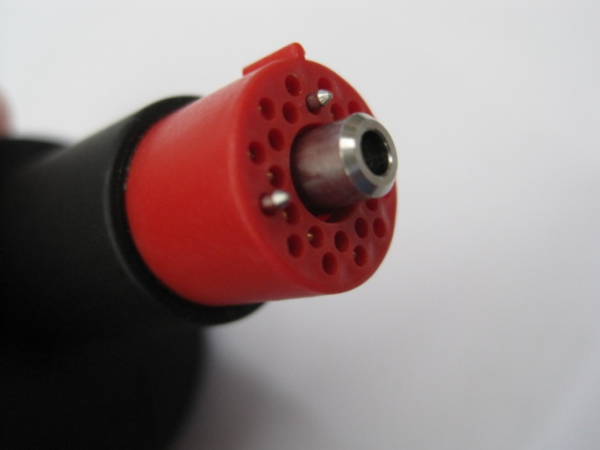 Only the steel location pins poke through initially allowing for location onto the PCB before pressing down and making all the connections. They all have a USB connection so they can plug directly into the PC if the power requirements are low. For a board where you only need one test head this can leave you with less stuff on your desk. Otherwise you connect them through the base station which provides extra power – well above what USB can normally provide. The base station acting as a USB hub and power injector to the test heads. Also included in the base station are some little passive test boards – one for each head – which allow for quick verification that each head is functioning correctly. There are built in test routines to use these within the PC application. While these can be removed from the base station, it”s quite convenient to use them in the base station as they hold the test head in place. The intended way to use the test heads is for the land pattern to be designed onto the target PCB itself, therefore not requiring the traditional “bed of nails”. In some cases this may not be possible though due to space requirements, or perhaps where you need additional external circuitry to be able to test a system. In this case you could design the footprint for the test head into the board containing the external circuitry, and for example, use the I2C interface on test head 2 to drive an I/O expander chip to allow an almost limitless number of inputs and outputs to be multiplexed into the eC-test-mate system, and still all be tested and controlled from scripts within the PC software. All in all it looks like a pretty versatile system. 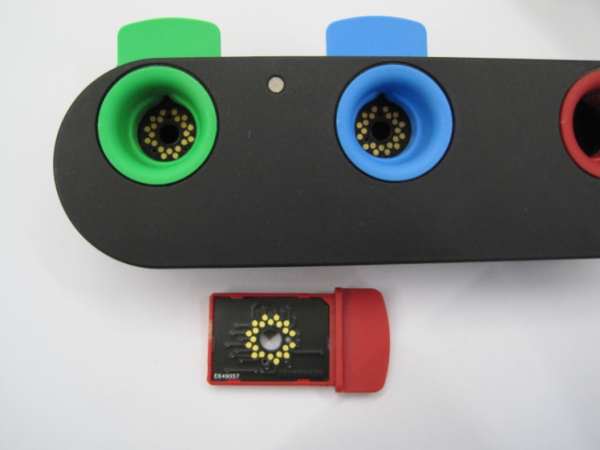 W Technology sees it being more than capable of testing the board originally identified as being a good contender for its application, and they look forward to incorporating its use into other product lines in the future. https://www.eurocircuits.com/wp-content/uploads/blog/W-Technology-an-eC-test-mate-user-reports/image1.png 414 600 Steve Jones http://www.eurocircuits.com/wp-content/uploads/2016/07/eurocircuits.png Steve Jones2015-09-22 06:27:232018-05-14 16:05:59W Technology – an eC-test-mate user reports. 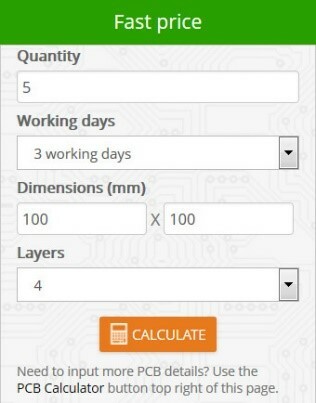 We have already streamlined the pricing and ordering procedures with built-in design-optimisation and data-checking tools to help you design lower-cost PCBs and avoid delivery delays due to data issues. Now we have updated the home page. 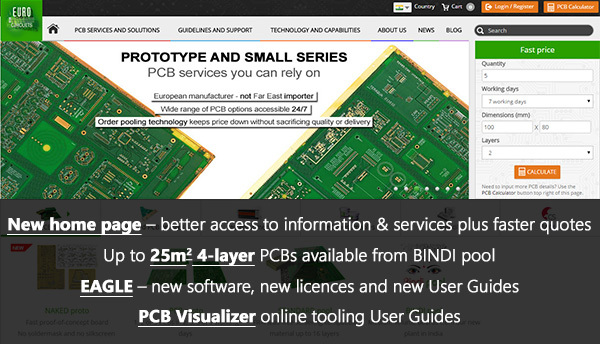 Faster access to information on our services and equipment, on our online tools and on many aspects of PCB fabrication. New Fast price option to get an instant price. 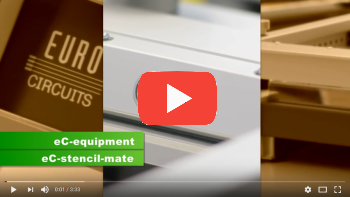 Need medium-volume 4 layer multilayers up to 25m2? With Eurocircuits assured quality? At lower cost? On a 15 working day delivery? 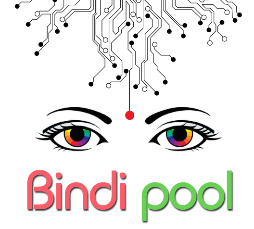 Go to our extended BINDI pool service. See here for full specifications. UL marking can be added to all boards at no extra cost. 7.4 released 1 September 2015. See our BLOG for new features and special pricings. New rental licences: EAGLE Make Pro and EAGLE Make Personal – flexibility and functionality for start-up designers. See BLOG. Discounted upgrades from EAGLE V. 5 & V.6. Calculate the cost for your upgrade here. Over the next 2 – 3 months we will release a series of User Guides for our design-optimisation, data-checking and order preparation tools. Each will include a step by step guide and a short video showing how to the get the best out of the tool. Watch out for an introductory email in the next 3 -4 weeks with a link to the first User Guide and an opt-in option so you receive an email link to each new Guide as it is released.